This is Bonny. 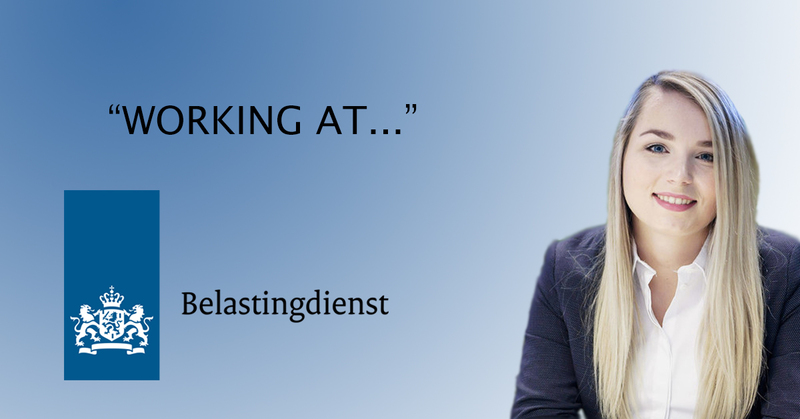 She is a student and follows the Dual accountancy track at the ‘Belastingdienst’. Within a few years, she has developed herself from a student to an independent accountant. During my bachelor program in Economics and Business Economics at Erasmus University, I already knew that I wanted to work in the field of accountancy. However, I did not want to work for a big, commercial company; rather, an employer with a greater societal impact looked like more interesting to me. I talked about this with some other students and one of them told me about the Dual track in accountancy at the ‘Belastingdienst’. Beforehand, I did some research, went to an inhouse day and quickly realized: this track perfectly suits me’. The Dual accountancy track consists of periods of study and work. The first six months, I was studying full-time. This is a very pleasant aspect of the track: studying is a fixed part of your week program and therefore does not have to happen in your spare time. On Mondays till Thursdays, I followed courses at the Belastingdienst Academy and on Fridays I went to Nyenrode for my (pre)master program. The Belastingdienst Academy courses are very practical; you are taught about different tax resources and audit techniques from teachers who work for the Belastingdienst themselves. The first period of studying is followed by a period during which the focus lies on working, which is what I am currently doing. Per week I work three days at the MKB part of the organization, spend one day at the Belastingdienst Academy and one day at Nyenrode; the perfect combination of working and studying. During those three days at MKB, I mainly perform audits together with my mentor. This holds that I perform pre-research, join company visits and construct final reports. Working with companies within MKB is pleasant since it is the entrepreneur itself whom you are in contact with. An additional advantage is that the contact is quite personal and informal. As an example, I recently brought a visit to a local ‘snackbar’. Their tax returns were not correct, and we quickly realized that own usage was not tracked correctly. In such cases you have the possibility to directly settle how these tax returns should be tracked in the future. Within a few weeks, I will finish my work within MKB and continue working for the organizational department ‘Grote Ondernemingen’ (freely translated: ‘Big Enterprises’). Working for GO sounds exciting to me since fiscal issues are to be handled differently and you work within bigger teams. So far, the Dual accountancy track completely fits my expectations. The main focus is your study program and you are basically in control yourself. For example, when joining a company audit you can decide yourself whether you take the lead or prefer to listen and learn. In addition, I have met many new people, both within the Belastingdienst organization and at Nyenrode. The track’s content is very interesting yet demanding. If everything goes well, I will finish the track next year. I hope to get the opportunity to directly start with a nice job, yet that should not be any problem giving that I am gaining so much knowledge and experience within this organization. In this edition of “Working at…” Bas van Beurden tells about his experiences as Assistant Accountant Audit at Witlox! In this edition of “Working At” Max van Loon tells all about his experiences at Van Oers!